It’s easy to have self- control when it’s just me. Me, my coffee, and a pretty sunrise. Enter my phone. Or three little blessings from Heaven who know how to push all my buttons. Self- control? What’s that? Even though we’re striving to be strong moms, sometimes I feel more like a weak mom. Pitifully weak. And specifically in this area of self-control. Because I’ve struggled with losing my temper from time to time, I’ve generally thought of self-control in the area of anger management. But it’s so much more than that. Self-control covers all areas of our lives! From anger to eating and drinking to commitments, exercise, shopping, time management, even my selfish tendencies or propensities! Just to be real with ya. I really struggle with time management, especially when it’s time to get out the door and be somewhere. That’s a really long way of saying I’m always late. The struggle is real. I always figure I have time. Time to switch the laundry, time to make a big breakfast and clean it up, time to feed the horse, write a letter. But there’s just not enough time when I only have an hour to get myself and three kids out the door! Since I know this is an area I struggle in, I’m constantly aware of it. But it takes real self-control to leave those clothes in the wash (they’re not going to mildew in the time it takes to go to the store), leave the mess from breakfast (who cares anyway? ), feed the horse when I get back (she’s not gonna starve), write that letter later (I’ll have plenty of time before the mail comes)! It’s so hard to do, but exercising self-control so I can be on time is more important. God is slowly teaching me that self-control really has two elements. Relinquishing my desires and yielding to Him. You have to let go of the reins before you can hand them to someone else. Relinquishing my desires (or not doing what comes naturally) can take on many faces. I want to yell at my kids, or grump at my husband, or scroll through Facebook for too long. Maybe I want to say yes to a commitment I probably shouldn’t, or sit on the couch instead of go for a run, or be alone when I should reach out to a friend who’s hurting. I need to acknowledge that’s what I want to do, and decide to do differently. Exercise self-control. There is action required on my part. I can’t just expect to sit back and let God do all the work. Nor can I expect to be able to do it all on my own. So the definition of self-control in Webster’s dictionary says, “the ability to control oneself, in particular one’s emotions and desires or the expression of them in one’s behavior, especially in difficult situations.” I find it interesting that one of the fruits of the Spirit is self-control. This self-control thing is really not all my doing, but it’s God’s doing through me, with my cooperation. I love that! Remember me saying that I often feel weak in this area? No worries! God’s got me covered! When I’m weak, He’s strong! And that’s what makes me strong! After I’ve relinquished my desires, my “wants”, I am ready to hand over control. 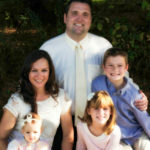 Yielding to God could be simply whispering a prayer of surrender in the moment of temptation, “Lord, You’ve got this. Guide me.” I may pause and take a deep breath before I open my mouth to spew out unkind words to my husband or kids. Check the clock and set my phone down to play with my toddler after I’ve been on it for a few minutes. Say “no, I can’t” with kindness and boldness to that commitment that will take away time from my family. Get up off my rump and go run! Text the friend who needs some TLC and see if she wants to come over for coffee. Even though doing what I want to do is easier, it’s not always best. One of my favorite songs by “Casting Crowns” says, “There’s freedom in surrender. 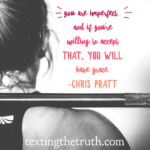 Lay it down and let it go.” In order for me to exercise self-control, I have to lay it down. 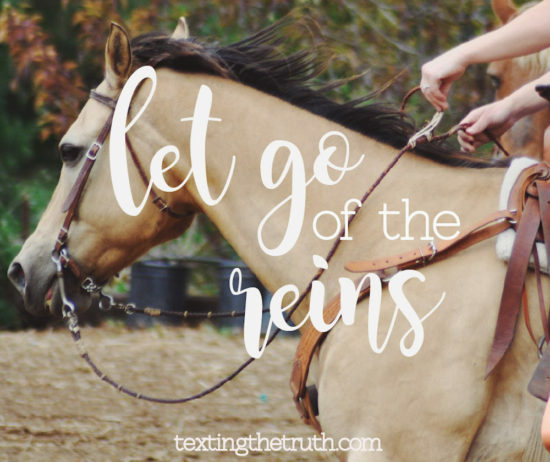 Let go of the reins. But, girls! We’re not in this alone! God is here with me and sees me. He’s on the throne. He knows my struggles! He created me and knows me better than I know myself! He’s got this. The real question is, am I willing to hand over the control of myself to the One Who controls the universe? Ask for wisdom in arranging your calendar- When I schedule too much in my week, usually the first thing to go is my time with the Lord. Furthermore, my patience wears thin with those around me when I’m constantly running from one thing to the next. Try to schedule some down-time. Do something you enjoy. Stop to smell the roses, notice the little blessings. 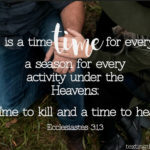 Make prayer a priority- The Bible tells us to pray without ceasing, right? How in the world can I do that? I think prayer needs to be our automatic response. As natural as whispering a plea for help during a difficult moment, or silently thanking God for a small victory with your child or yourself. It doesn’t have to be an hour-long, war room-type vigil… although that is awesome too! God loves to hear us talk to Him throughout our day, even in the little things. I don’t know about you, but I sure can’t do life without Him!